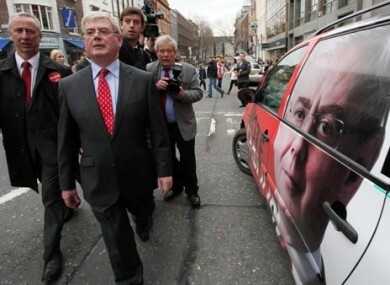 A Millward Brown/Lansdowne poll commissioned by the Irish Independent sees Eamon Gilmore’s party recoup some support, standing on 20 per cent – unchanged from the last Independent poll, but gaining ground on polls published last Sunday. Fine Gael remains by far the most popular party, accounting for 38 per cent of first preference votes, while Fianna Fáil’s poor fortunes continue: its support falls back to near-record lows of 14 per cent. Sinn Féin’s support has also begin to slow down; its share of the vote falls by one point to 11, while the Green Party can count on just one per cent of support. Independents and others account for the remaining 16 per cent of voting intention. A Red C poll commissioned by Paddy Power, which is understood to be the final poll of the 2011 election campaign, will be published tomorrow morning. Email “Labour recovers some ground in latest opinion poll”. Feedback on “Labour recovers some ground in latest opinion poll”.